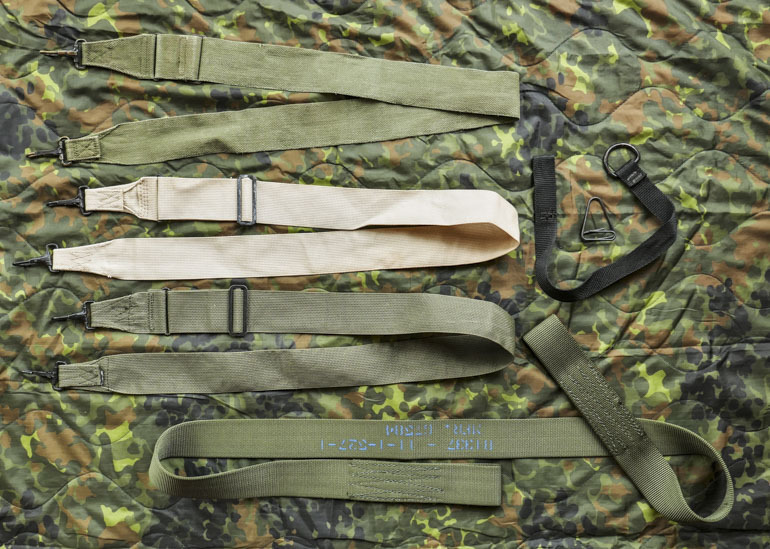 By Joe Grine and Tony T.
Tactical slings have come a long way since the Vietnam-era field expedients that we used in the Army as late as the early 1990s. One of the hottest slings on the market is the Sly Tactical Quick Conversion Sling (“QCS”). While not offering “new” technology per se, the QCS offers a better design and execution of existing sling concepts based on years of experience from numerous SWAT team personnel. These slings are rapidly becoming the go-to sling for SWAT and patrol teams all over the country, and earn our highest recommendation. [Intro by Tony T]. With time, knowledge and experience comes the rarefying of taste. There are clothes I once wore I wouldn’t touch today (parachute pants? ), cars I once drove I now wouldn’t even sit in (Ford Bronco II), and defensive kit I once carried I would not consider nowadays (e.g. a S&W Model 19 snub-nose with skinny factory wood stocks loaded with .357 Magnum Winchester Silvertips). In the weaponry world, it’s not so much that my equipment was terrible, or even bad; it is just that today I have so many better choices available to me. So it is with slings. In my youth, I owned two of what we would today classify as “defensive rifles.” One was a wooden-stocked Ruger Mini-14, and the other was a Colt AR-15 HBAR with a 20” barrel and fixed stock. Knowing no better, I carried both on the slings they came with: a standard US GI black cotton web 1.25”-wide “silent sling” with dual sliding metal keepers (NSN: 1005-01-216-4570, 54″ long). Both my rifles had conventional fixed sling swivels on the bottom of the buttstock and gas block, so that is where I attached my slings. Being right-handed, I carried the rifles in the standard way, either slung barrel up on my right shoulder (“American carry’) or slung barrel-down on my left shoulder (“African carry”). This worked well enough for my purposes, including coyote hunting, and the GI silent slings still have their advantages today. They are cheap ($10), very durable, simple to use as carry straps or aim-steadying “hasty slings,” quite non-slip on the shoulder (as long as you get the grippier cotton models, not the slippery 100% nylon versions), and present a non-threatening appearance when worn on either shoulder. The world’s post-war armies generally felt the same way, and issued similar simple cotton webbing slings for their Kalashnikovs, FN FAL rifles, M16 variants, Simonovs, Vz58s, etc. Prior to the 1970s, “patrol” carry was not generally standardized for in use for rifles, however. Starting around that time, however, several manufacturers began offering slings suitable for carrying the newer, shorter, post-war carbines in the patrol position: Heckler & Koch, Steyr AUG, FAMAS, and others. The US military noted that many Vietnam soldiers preferred the patrol position, and offered a conversion kit to place swivel attachment points on the top of the M16 rifle’s buttstock and front sight block. A sample is shown in the photo below, along with samples of the more common field expedient canteen / Medic bag sling. Also shown below is the field expedient tow strap, which was popular with M-60 gunners before purpose-made slings became available. There were two advantages of the patrol position. First, it allowed speed into action: the rifle was carried in front of the body, with the firing hand on the pistol grip. Second, the rifle’s frontal carry meant less interference with backpacks, rucksack frames, canteens, pistol holsters, buttpacks, entrenching tools, or other gear the soldier was carrying on his back or belt. But with these advantages came one big drawback: the rifle’s muzzle could easily be inadvertently pointed at other members of the patrol. Also, the fixed length of the sling precluded its use as a traditional shooting aid; a sling long enough for the patrol position was far too long to be used as a tensioning device on the weak arm. That might be acceptable for the close-range, fast and frenzied defensive fire of an ambushed jungle patrol, but it was suboptimal for general military use. Heckler & Koch was the first major military manufacturer to consider these issues and produce a quick-adjustable three-point sling for general issue. While clever, this H&K “multipurpose carrying sling” proved too complex, complicated, and snag-prone to ever become popular with troops. As they found out, three-point slings constantly hang up on web gear and catch on door handles, tree branches, and every other protruding object in a one-meter radius. Similar efforts from other manufacturers produced similar results. Fortunately, the situation today is much improved. Most of the evolution of modern slings is primarily due to two things: the wars in Iraq and Afghanistan, and the rise in popularity of tactical training. Beyond that, however, there is a third group of professional high-stakes sling users, whose contributions must be noted: law enforcement officers. Police have all the requirements of other sling users – speedy deployment, secure carry, non-interference with gear, quick adjustability, aid in accuracy, etc. But police officers have more specialized concerns that do not readily apply to civilian shooters, home defenders, or combat soldiers: (1) rifle retention if assaulted by a would-be gun-grabber, and (2) the need to instantly (and safely) stow the longarm to move in and handcuff a suspect. That is where our featured product – and company – comes into play. 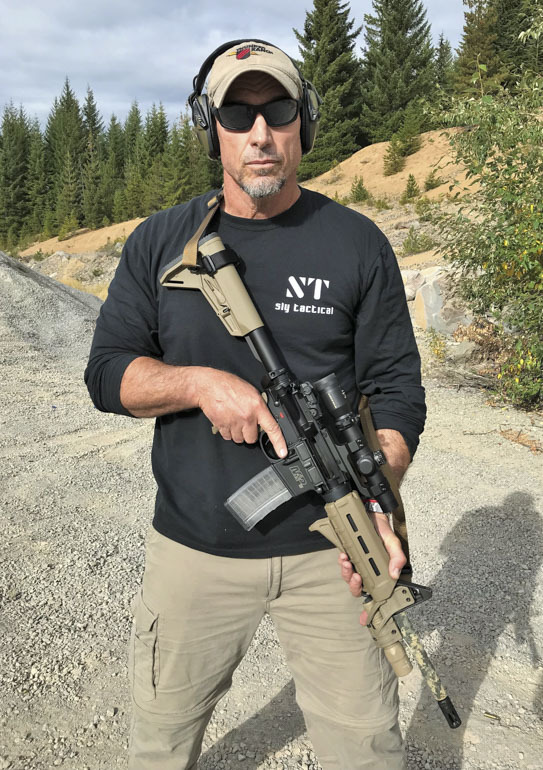 The founder of Sly Tactical, Kevin McCarthy (shown above), is a retired police officer with years of experience in patrol, SWAT, and a street crimes unit responsible for narcotics enforcement and high-risk operations. Dissatisfied with the various slings and attachments he experienced, Kevin modified them in order to make them work for him. This led him to pursue making something better. Having consulted with numerous tactical officers from various agencies, Kevin addressed the shortcomings he and others encountered with various products. This led him to develop Sly Tactical. Now Sly Tactical slings and sling attachments are in use with multiple law enforcement agencies across the country. Sly Tactical’s signature product is the is the Quick Conversion Sling (“QCS”). It recognizes that both one-point slings and two-point slings have their advantages and disadvantages, and attempts to combine the “best of” features with a convertible design. It makes sense to be able to convert from one to the other at a moment’s notice, depending on mission requirements. For example, in the event the operator needs to secure the weapon close to the body and not have the weapon hang freely in front of them, then the two-point configuration is preferred, as shown above. On the other hand, a one-point configuration gives the operator the greatest freedom of movement in a dynamic entry, to achieve various firing positions while still maintaining sling retention. Let’s talk about materials and construction. These slings are 100% made in the USA with U.S. made nylon, acetyl and CNC machined aluminum. The slings are made from mil-spec Class 1 nylon webbing (used for critical and life support applications) and are sewn with mil-spec thread throughout. The 1-inch nylon sling material exceeds the mil-spec load rating of 2500 lbs. Feeling these slings reveals the quality of the materials. They have a heft and silkiness that cannot be adequately captured by words or photographs. The attention to detail is obvious; you will not find a jagged stitch or loose thread anywhere on a Sly Tactical sling. I expect to have to burn off loose threads with a Bic lighter whenever I get a new piece of military nylon kit or clothing; no need for that with the Sly Tactical gear. The hardware is just as excellent as the software. Sly Tactical’s aluminum parts and attachments are CNC-machined from 6061 T6 aluminum and mil-spec Type III hard anodized. When QD interface is requested, they use the excellent “Forged [QD] Sling Swivels” (“FSS”) made by ALG Defense. Sly Tactical only uses screws made out of stainless steel with a black oxide coating, so you won’t be unpleasantly surprised when your sling screws begin to rust (as happened to me once with an inferior product). Sly Tactical is thoughtful enough to include a small container of Blue Loctite with their slings and mounts, as a gentle reminder to purchasers (apparently a note stating “Hey Idiots – Loctite Your Mounting Screws!” would be cheaper, but not so wise from marketing standpoint). [Joe Grine] We now turn to a discussion to some of the more specialized features of these slings as well as some of our favorite accessories offered by Sly Tactical. The patented shelf greatly enhances the ability of the operator to open the snap hook gates quickly and easily, especially when used with gloves: they are less likely to get caught in the gate. Overall, it’s a solid improvement and it makes we wonder why nobody figured this out decades ago. The thumb tab is machined from 6061 T6 aluminum, and attached to a heavy-duty HK snap hook with a stainless steel Philips head screw with black oxide coating for corrosion resistance. Sly Tactical sells these as a package for $14.95. T-Handle & Quick Adjust Slider. One big advance in sling design involves the introduction of quick adjustment capability (aka: “sliders”). Sly Tactical improved on the original slider designs by incorporating an easy-to-locate “T-Handle” made out of “ballistic” nylon. The Sly tactical slings are quickly adjustable for length, with an ease I have not experienced with competing products. I have never found a sling that adjusts so easily, rapidly, and positively. The “T-handle” is superior to the tabs and rings used by other makers. Tabs can be hard to find, and easily slip from one’s grasp. Rings share these drawbacks, while also hanging up on everything. We have seen some competing designs featuring a loop, but that design would hang up too easily on branches or any available protrusion. The advantage of the T-Handle is that is distinctive and recognizable to the touch, so it can be used with visual indexing, and it will not snag on passing objects. Sly Tactical’s Single Point Buckle is really the heart of the QCS system. This buckle allows the operator to transition from a two-point sling to a one-point sling in a matter of seconds. This can be a very useful feature for police and military operations. For example, the single point configuration offers more flexible gun handling, but is not ideal for hands-free operation. Conversely, the two-point configuration allows for better muzzle control when hands free operation is needed, such as when cuffing a suspect, rappelling, climbing a ladder, deploying grenades, operating a radio, or reading a map. Sly Tactical’s Single Point Buckle is manufactured from 6061 T6 Aluminum and is hard anodized to Mil Spec 8625 Type III. Sly Tactical developed the patented Rear Sling Attachment (“RSA”) at the bequest of law enforcement agencies seeking to add sling attachment points that are compatible with the HK style snap hook clips. Military and law enforcement personnel are typically not allowed to work on their own guns due to liability reasons. Sly Tactical saw the need for a rear sling attachment point that did not require the operator the unscrew the castle nut, which is often staked down and is a unit-armorer level replacement in many jurisdictions. Kevin McCarthy’s first-hand experience with QD attachments coming free from their attachment points at inopportune moments (as well as hearing similar stories from other Police officers) led him to develop a strong preference for the HK snap hook clips over QD swivels. He decided to design and manufacture sling attachments for that interface. The RSA incorporates an ambidextrous vertical loop and is streamlined, lightweight (approximately 0.6 ounces with screws) and doesn’t’ interfere with manipulation of the charging handle. This design orients the snap hook in an ideal manner so as to not bind or twist and it was designed so that it won’t slip or rotate. The RSA is CNC machined from 6061 T6 Aluminum, and is hard anodized per Mil-A-8625 Type III Class 2 and comes with Loctite and an allen tool. I’m now running the RSA on two of my AR-15s, and they function as advertised. The horizonal front sling mount is used in conjunction with quick attach/ detach devices such as the HK Snap hook clips. It allows the operator to easily transition from a one-point configuration to a two-point configuration. This attachment only weighs approximately 0.5 ounces (with screw) and comes with Loctite. The “loop” accommodates snap hook type attachments, and is designed to minimize weapon roll when the weapon is at rest in a two-point configuration. It is longer and thinner than competitor’s designs for ease of attaching to in low light situations, and is radiused for easier attachment and detachment. Sly Tactical invested quite a bit of money into the engineering of this design to ensure that it won’t break. If you do manage to break one, Sly will replace it. The vertical mount is designed for two-point slings where the operator does not need a quick attach/detach device. This mount only weighs approximately 0.4 ounces (with screw) and is ideal for those looking for an attachment that is streamlined and lightweight. It is also ideal for silent operation, since there is no loose metal to metal contact. To attach the two-point sling to the vertical mount, simply feed the sling through the loop and back through the tri-glides to lock it in place. Included is a black oxide coated stainless steel screw for corrosion resistance and Loctite. The screw on this attachment as well the horizontal front sling attachment for the QCS have Phillips heads on them because these screws are common and most users don’t carry hex or Allen head tools on them. [Tony T] Let’s briefly discuss the competition: The Vickers Blue Force Tactical Sling is often recommended, and it is a fine product. However, Sly Tactical uses better materials and features the T-Handle upgrade. I own three Magpul slings, which enjoy wide distribution and a good reputation for occasional use, but they are not even close to being in the same league as the Sly Tactical slings in terms of materials, machining, and thoughtfulness of design. The Ferro Concepts “Slingster” is quite modular and well-made, but again, the Sly Tactical T-Handle is much better than any loop design. Frank Proctor’s “Heavy Duty” sling is a quality budget sling ($32) but lacks quick adjust features. Overall, the Sly Tactical sling is a clear cut above the competition. The Sly Tactical two-point and quick conversion (QCS) slings we tested have four clear advantages over these cheaper slings: ease of use, versatility, comfort, and quality of construction. Finally, these slings can be ordered custom cut to length depending on your height / build. The care and attention to detail that goes into making a Sly sling is obvious as soon as you pick it up. The nylon feels silky, the double-stitching is even and beautifully executed, the metalwork is smoothly coated, carefully rounded, and very trim, unlike the bulky clips and buckles on competing models. When placed side by side to a Magpul sling, you can immediately see the tighter weave of the Sly sling. If I had to describe the Sly slings in one word, it is “sleek” – there is a trimness, an economy of purpose, that is readily apparent in these products. Perhaps an analogy would be the different feel of a $35 Kershaw folding knife and a $150+ Benchmade. Both will cut, but the Benchmade has a polished, precision feel that the cheaper, cruder Kershaw cannot match. And, in my experience, the Benchmade will hold up better to hard use. I have a fifteen year old Benchmade folder that has seen some brutal use, but the knife looks and feels new (other than wear to the blade coating). It replaced a high-end Kershaw (the 1510ST “Random Task” Ken Onion) that wore out after only a year or two of moderate use. After testing for four months on multiple range trips, the Sly Tactical slings give every indication of Benchmade-level durability over the long run. And each sling comes with a lifetime warranty, which certainly inspires confidence. In sum, Joe and I agree that the Sly tactical slings are the best on the market. While competitors can (and do) make good products, none can match the build quality, durability, ease and positivity of adjustment, and practicality of the Sly tactical models. The Sly slings cost a little more, but quality gear always does. Like a lot of shooters, I have learned – the hard way – that cheap firearms accessories can fail at the worst possible times. Painful experience has taught us that top-of-the-line gear is the way to go for equipment that might one day save your life. Buy once, cry once. For defensive rifles that we need to rely on, we use only the best optics – Trijicon ACOG, Aimpoint, Nightforce, Leupold, Schmidt & Bender- even though they cost a pretty penny. From this point onwards, our SHTF rifles will be wearing Sly Tactical slings as well. There is no higher endorsement we can give. Customization: Cut to specification based on height and build, left vs right hand operation. Two-point padded: $64-70 (depending on options). Two-point unpadded: $57-63 (depending on options). QCS padded: $95-127 (depending on options). QCS unpadded: $90-122 (depending on options). No issues; no visible wear or tear after five months of use. The nylon used by SLY Tactical has a silky smooth feel unrivaled by the competition. The padded option adds comfort over an extended period of time. Sly Tactical sling come in multiple colors (Black, Foliage Green, Coyote Brown, and OD Green) to match your rifle and gear. The “T” Handle slider adjustment tab allows for easy adjustment and won’t get hung up or snagged. The thumb tab added to the HK snap hook clips is a great idea that improves the ease of use. Sly Tactical slings are absolutely first-rate products designed for police officers who use their slings on a daily basis. After extensive testing, they have earned our solid “Do Buy” recommendation. Dayum! One of the longest reviews I’ve seen and on a sling no less. We called them boonie or boonie pack slings. A close variant is made today by boonie packer and sold at Cabellas. I use it on all of my long guns. Adjustable length make is much more flexible than explained in the article. Allows one or both hands on gun in ready position or both hands completely off for other tasks with rifle still at the ready. Great for bear country where immediate employment can be critical. Can control muzzle direction up/down and horizontally right/left. Can shorten sling placing rifle scope up under arm pit for protection in heavy brush. Rifle can be slung around onto back muzzle up or down in rain. Most flexible and functional sling ever devised. Why anyone would use the traditional firle sling is beyond my understanding….other than they have never encountered the boonie sling. Each to their own. I prefer my M1907 slings. 1907 = Square range sling. Great for Camp Perry, but it’s not for modern military or police work. I remember in 2004 we were using slings made from gym bag straps and 100 mph tape. And taping a mini maglight to rifles. Great write up and looks like a quality sling. FYI, Specter Gear has that same style sling out for a few years now. I think it’s called the TCS convertible and run about $50.